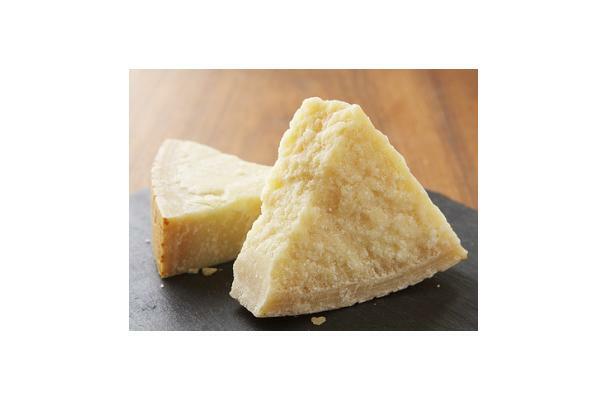 Parmesan is a hard, cow's milk Italian cheese with a sharp flavor and grainy texture. Nutty, salty and creamy. Although parmesan cheese comes in a variety of forms, flavors and brands, Parmigiano-Reggiano is considered one of the best cheeses in the world by many chefs and gourmands. True Parmigiano-Reggiano is aged 2 years and has the name stenciled on the rind. Hard yellowish cheese which breaks in a sliver-like pattern. Choosing: Never purchase any fresh parmesan wedge that does not have a rind. A cheese that has been too long on the shelf is whiter in color and will most certainly be too hard. Commercially ground parmesan in canisters remains an economical and convenient option, but there is a significant difference in flavor. Most brands have a very long shelf life. Buying: Any grocery store or specialty cheese shop. Procuring: To bear the Parmigiano label, Parmesan cheese must be made from cow's milk between May and November in Modena Parma, Reggio Emilia, or parts of Bologna and Mantova. The cheese is traditionally made by mixing whole morning milk with skim milk from the previous evening. The milk is then heated and mixed with rennet to form curds, which are pressed in a cheese mold. True Parmesan cheese is molded with a stencil, indicating where and when it was made. The cheese is then soaked in a brine bath and then aged for a minimum of two years before being graded for sale. Great topping of choice for every type of occasion from pizzas to mushroom risotto. Also a perfect appetizer or dessert cheese. May be grated into soups, added to a baked potato or melted on top of a hot buttered slice of French bread. Can be used for dressings or meatloaf, when added to bread crumbs. The rinds can be saved and cooked in liquid to make a flavorful broth. Fresh parmesan can be kept for about 4 weeks as long as it's refrigerated. Wrap it first in a layer of wax paper and then in foil. Each time of use, make sure you rewrap it in a clean sheet of wax paper. Parmesan can be frozen whole or shaved, but may have some flavour deterioration. Ground, dried parmesan does not need to be refrigerated until opened, unless it was purchased in the dairy section at the store. Once the seal is removed, flavour will remain at its best with refrigeration. History: It is not known exactly when the production of Parmesan cheese started; however, there is documentary evidence confirming that Parmesan cheese was being produced in the Parma area of Italy at least seven hundred years ago.